San Francisco Pedicab campaigns are our bread and butter. Thanks for your inquiry about campaigns with Cabrio Taxi Pedicabs. We will get back to you shortly. Cabrio Taxi Pedicab Operators lease our pedicabs daily to conduct their normal operations throughout the City of San Francisco. Their earnings can highly vary depending on the events of the day -- like Giants Games, Pride Parade, and Fleet Week -- and the weekly ebb and flow of traffic in our major operating areas. During branded services, we pay our operators a premium on their opportunity cost to ensure both that your branded service is their top priority and that they are thrilled to be a part of it. Acknowledging our operator's economics allows us to retain the World's Best Pedicab Operators, who hone their craft daily, and to make sure their top-tier professionalism is fully employed for your branded service. Event producers and conference organizers are always looking for new revenue generating opportunities to ensure their events continue to grow and prosper. Sponsorship platforms are part of every special event because they help drive revenue growth, while providing corporate partners with tremendous value through access to your audiences and the targeted demographics that they represent (e.g. sports fans, music lovers, exercise enthusiasts, conference attendees, etc.). Transportation at large special events in San Francisco is always a challenge for event producers and a source of frustration for those attending the events. Combining transportation with marketing is a no-brainer, which many events have done in the form of shuttle bus sponsorships, free car rides, etc. But many people that take public transportation, walk or bicycle to special events in San Francisco, and thus do not benefit from these services nor see the messages they carry. And it’s often the last mile that is most frustrating at crowded events. Pedicabs are uniquely equipped to help in move people through those last steps, while generating unforgettable memories and smiles. We call it the “last mile with a smile.” One client called us a “Smile Factory!” Associating a brand with this experience, is a powerful way to ensure the brand message is remembered, while strengthening the brand’s relationship with their customers. Sponsorship packages can consist of Free Ride Campaigns for the biggest impact or Mobile Outdoor Advertising. Both platforms offer sponsors an opportunity to get their brand in front of your audience, while generating additional revenue for your event. And don't worry: we have refined materials to help you pitch your sponsors! Though usually a ride is all it takes. Thank you for submitting your request! Geoff will get back to you as soon as possible! For companies that want their advertising dollars to generate lasting relationships with their customers, we offer "Free Ride Campaigns." Free ride campaigns are the ultimate experiential marketing platform because they get noticed and develop customer gratitude that translates into brand loyalty. During free ride campaigns, Cabrio Taxi’s drivers serve as brand ambassadors, delivering your message verbally, through collateral materials, via social media, or even distributing product samples. 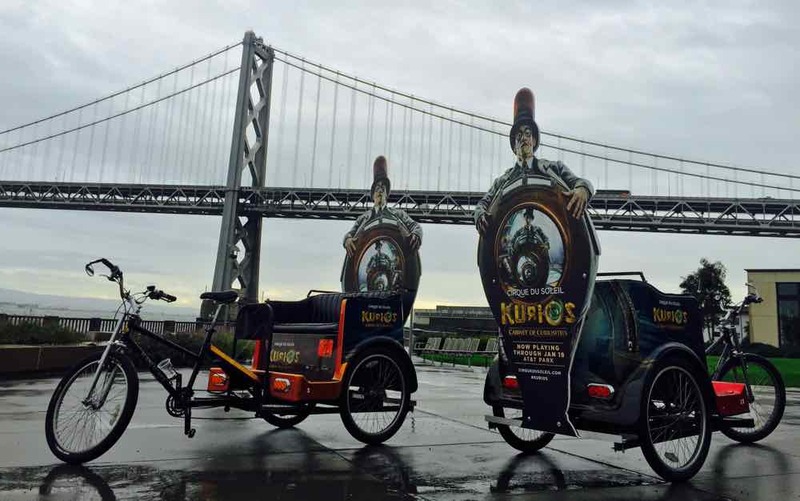 Complimentary rides along with advertising are the ultimate experiential marketing platform for delivering your brand’s message in San Francisco and the best way to say “Thank you” to your customers. Even those that don’t take a free ride will associate your brand with this gift. We don’t just make impressions, we make connections. Pedicabs are an experiential marketing platform that allow our clients to make more than mere impressions. Our platform provides an opportunity to deliver a brand message directly to potential customers, while associating that brand with a fun and memorable experience. San Francisco hosts numerous special events throughout the year that draw large crowds, providing fantastic advertising opportunities to focused demographics. No matter what your target market is, there is likely a special event or conference in San Francisco that brings them together. Cabrio Taxi often works directly with special event producers through an integrated sponsorship platform, but for those special events that haven’t partnered with us, you can still get your message delivered to their audience. Wether you are looking for a single day activation, or want exposure during the entire baseball season, our special event advertising can be crafted to meet your marketing goals. Here’s a list of just a few of the exciting events taking place in San Francisco in 2013. Where’s your target demographic gathering this year? Reach a larger audience in one of America’s most beloved cities by advertising with Cabrio Taxi. We reach more potential customers than any other form of stationary billboard advertisement or outdoor media with a lower Cost per Mile (CPM). Pedicabs provide an opportunity to deliver a brand message directly to potential customers, while associating that brand with a fun and memorable experience. Pedicabs provide an opportunity to deliver a brand message directly to potential customers, while associating that brand with a memorable experience that leaves a lasting impression. Cabrio Taxi’s pedicabs are are seen by millions of San Francisco residents and visitors each year. Our mobile advertising platform reaches numerous demographics throughout San Francisco but is also deployed to special events that focus on key markets (e.g. sports fans, music lovers, exercise enthusiasts, conference attendees, etc.). Pedicabs operate in and around crowds, thus your message will get closer to your audience than any other form of media. We reach more potential customers than stationary or mobile outdoor media with a lower Cost per Mille (CPM). As we roll by at speeds slightly faster than walking; pedestrians, cyclists and motorists have time to absorb your messaging, while associating your message with an eco-friendly mode of transportation. In 2011, San Francisco hosted 16.3 million visitors who spent $8.5 billion in the city. Reach a larger audience in one of America’s most beloved cities by advertising with Cabrio Taxi. Cost Per Mille (CPM) is a commonly used unit used in advertising and is based on the cost of a unit of advertising based on 1000 impressions (from the Latin, mille). In the areas we traffic, we reach more potential customers than any other form of stationary billboard advertisement or outdoor media with a lower cost per CPM. However, unlike taxi cabs or static billboards that fade into the landscape or the roadway, pedicabs provide more than just a passing impression. They grab attention! Connections translate into customers at a much higher rate than passive outdoor media impressions. On the street, pedestrians, cyclists and motorists will have time to absorb your message in the pedicab ads. Passengers will have 10 - 30 minutes to interact with your brand ambassadors, our drivers, all the time looking at your message on the back of the drivers’ t-shirts. Passengers can even grab a flyer if they want to learn more about your brand. Passengers have fun experiences that they will remember and associate with your brand. Move beyond impressions, make connections! Pedicabs are interactive and fun, while creating tremendous buzz and excitement. Sure, pedicab advertising will deliver impressions, but more importantly, it generates connections directly with new and existing customers. With many avenues to success, our team will work with you to find the most effective solutions for your advertising needs. Let's design your best campaign. Here are some ideas to get you thinking. Also see our examples. We work hand-in-hand with our clients to execute pitch-perfect campaigns. Whether it’s helping a client drive brand awareness or building messaging around a specific event, our unique platform delivers your message to your customers at the right time. Bring Your Message to Life With Cabrio Taxi Pedicabs. Our experiential marketing platform allows our clients to make more than mere impressions. Cabrio Taxi pedicabs are are seen by millions of San Francisco Bay residents and visitors each year. We have solutions for businesses of all sizes. 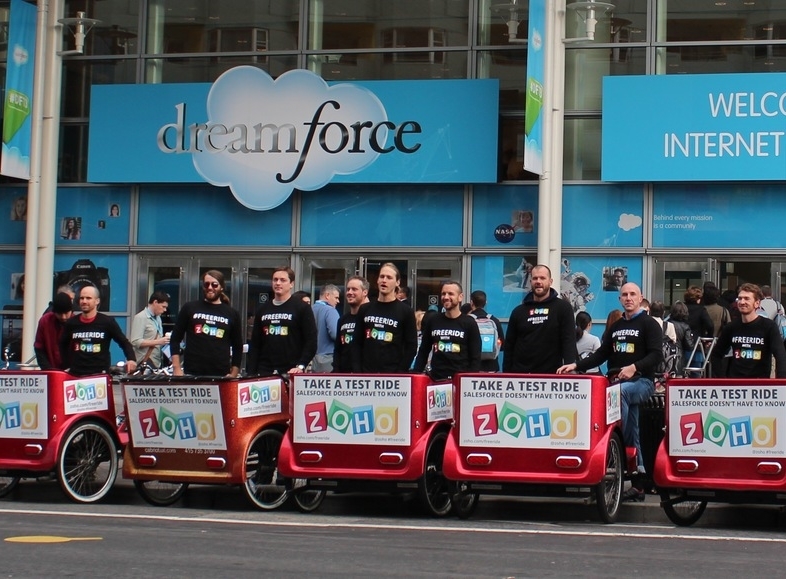 Free pedicab rides create tremendous excitement and associate your brand with good experiences. Passengers, motorists, and pedestrians will see your brand associated with an eco-friendly mode of transportation, which leaves a lasting impression. Cabrio’s drivers serve as brand liaisons and can distribute your message verbally, through collateral materials and social media, or deliver passengers to designated areas and/or street teams.